It’s no secret that Facebook’s organic reach has long been in decline. 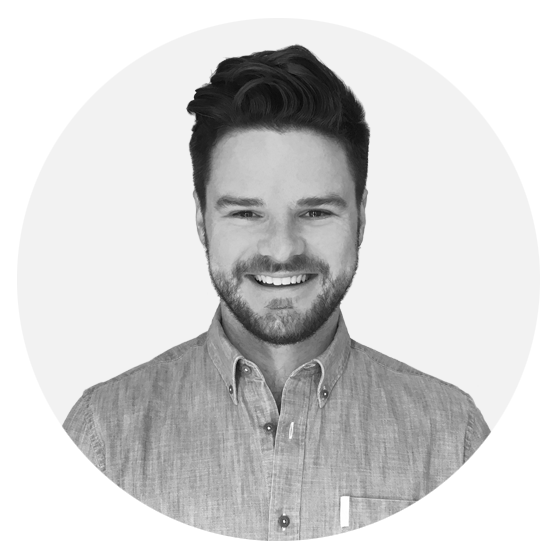 I recall sitting in a room with a client five years ago selling the channel as a cost-efficient means of talking to your consumers regularly. This was long before EdgeRank when your News Feed was sorted chronologically. Of course, a great deal has changed since then. What was presumably once 100% organic reach of active users is now down to single digits and continues to fall. The impact of which you can see in this example highlighted by Rhys Hillman. This is the same piece of content, posted at the same time by Snickers on two different channels. The Facebook post, distributed to a potential 11 million fans generated only 6,000 engagements. Yet when the same content was published on Twitter to a 99.5% smaller audience, it generated 1050% more interaction. 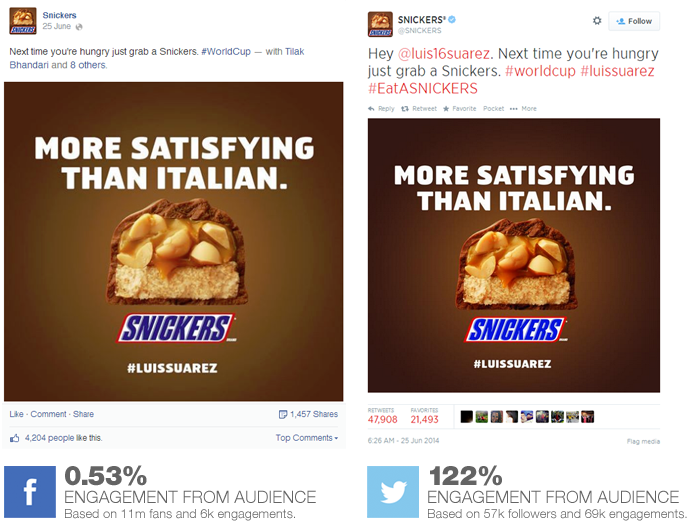 But, to be fair, the Snickers post on Twitter is an outlier of success. In fact it performed so well, that the number of engagements was actually higher than the brand’s total number of followers. 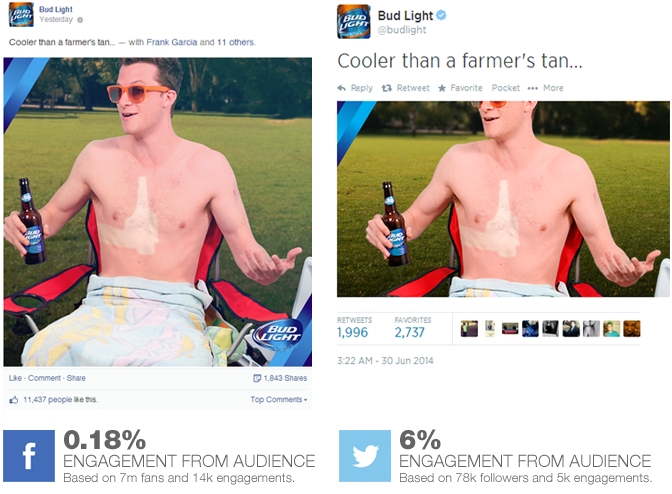 So let’s take a look at this more reasonable, less ‘viral’ post from Bud Light. Although not as drastic, Twitter once again hugely out performs Facebook. Anecdotally, this is consistent across a number of brands I reviewed, both big and small, as well as international and local. As this organic reach falls to nearly 0%, we become apparent of Facebook great dirty bait and switch. Facebook have encouraged brands for years to build their community (and invest significantly in media buys for acquisition) under the pretense of being able to engage with them often and for free. But that is no longer the case. And their ‘solution’ is to invest even further in promoting posts. At the end of the day, the above examples make it increasingly difficult to justify the significant resource it takes to manage a Facebook community effectively and I wouldn’t be surprised if clients start shifting their budgets elsewhere. I'll be the first one to put my hand up and suggest the numbers are not science. Ideally you would measure reach of posts and exclude any interactions generated from non-followers. But as an anecdotal comment on the state of things, the trend stands. Some great observations here Zac. The challenge is that for some brands Twitter isn't as powerful a channel as Facebook and so they are stuck with FB as that is where the majority of their audience is. As all these SM platforms move into monetisation the reality is for all brands that there will be some element of pay to play. They will eventually become what newspapers were like in the 20th Century. Editorial content (audience) with ads in between to fund it. Over the years, brands have been doing everything they can to get more likes on Facebook. Obviously the better brands were able to create viral content, but all firms have been trying things from various types of contests, cross promotions from their own website, email messaging and marketing, signs and stickers in their shop windows, and even buying likes from the types of companies listed at Fans Reviews for instance. But now with how the Newsfeed algorithm uses a thing called edgerank to choose what types of content to display (and Facebook makes more money if brand's content isn't displayed) there's an incentive for them to craft a system where engagement is minimal so that brands have to pay them more money to actually get any value out of Facebook. It kind of reminds me how the SEO industry changed from the initial years where companies were doing anything they could to get as many low quality links published and then had to scramble to change how they operated.